For other uses, see Dancing in the Moonlight (disambiguation). "Dancing in the Moonlight" is a song written and originally recorded by the French-American rock group King Harvest. It was released as a single in 1972 and reached number 13 on the Billboard Hot 100. The song was written by Sherman Kelly and originally recorded in 1970 by his band, Boffalongo, and released as a single. In 2000 a cover by English band Toploader became a worldwide hit and achieved multi-Platinum status in the United Kingdom. The song was written in 1968 by Sherman Kelly, whose brother, Wells Kelly – King Harvest's drummer – introduced the song to the band. It was originally recorded in 1969 by the American band Boffalongo, which included Sherman Kelly (singing lead on the original recording of his own composition) and future King Harvest frontman Dave "Doc" Robinson. Wells Kelly later became the original drummer for Orleans. 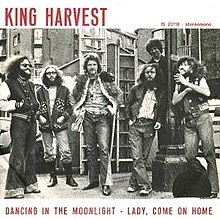 Meanwhile, while based in Paris, King Harvest recorded and released "Dancing in the Moonlight" as a single with "Lady, Come On Home" on the B side. Steve Cutler, a jazz drummer from New York City (standing on the base of the pole in the cover picture), plays drums on the tracks and toured with the band in France and the UK. The group disbanded after six months and the single languished for a year until it was bought and released worldwide by Perception Records. The song was also recorded by High Broom and released in 1970 on Island Records (catalog no. WIP 6088; vinyl 7"). It failed to reach the UK Singles Chart. In 1973 the singing and dancing act Young Generation released a cover version; despite airplay, it failed to chart. In 1994 the Baha Men released the song as a single, but it also failed to chart. Their version was later used in the movie Fat Albert. The song finally charted in the UK in March 2000, after being covered in 1999 by Toploader. In Canada, the song made number 5 in the weekly charts and number 71 in the year-end chart for 1973. CD single, cassette single, 7", 12"
(1999) "Dancing in the Moonlight"
In 2000, English alternative rock band Toploader released a cover of "Dancing in the Moonlight". It was originally released in February 2000 as the third single from their debut studio album Onka's Big Moka (1999) and peaked at number 19 on the UK Singles Chart. It was then re-released in November of the same year and reached number seven on the same chart. The song has been certified 2× Platinum by the British Phonographic Industry for sales of over 1,200,000 copies. Worldwide, the song reached the top 20 in Australia, Germany, Ireland, the Netherlands, Norway and Spain. In 2007, the song was placed at number 17 on BBC Three's list of "The 100 Most Annoying Pop Songs...We Hate to Love". The Toploader rendition of the song was featured on the soundtrack of the 2002 film "A Walk to Remember" and also used on the soundtrack of Netflix's "Umbrella Academy" in 2019. Alyson Stoner for the 2009 Disney movie Space Buddies. ^ "Dancing in the Moonlight – King Harvest : Listen, Appearances, Song Review". AllMusic. Retrieved May 22, 2013. ^ "Sherman Kelly". Sherman Kelly. Retrieved May 22, 2013. ^ "Wells Kelly". Orleansforever.com. Retrieved May 22, 2013. ^ "High Broom - Dancing In The Moonlight (Vinyl) at Discogs". Discogs.com. Retrieved April 25, 2014. ^ "Images for High Broom - Dancing In The Moonlight". Discogs.com. Retrieved April 25, 2014. ^ Whitburn, Joel (2002). Top Adult Contemporary: 1961-2001. Record Research. p. 137. ^ "Ultratop.be – Toploader – Dancing in the Moonlight" (in Dutch). Ultratip. ^ "Ultratop.be – Toploader – Dancing in the Moonlight" (in French). Ultratip. ^ "Offiziellecharts.de – Toploader – Dancing in the Moonlight". GfK Entertainment Charts. ^ "Chart Track: Week 47, 2000". Irish Singles Chart. Retrieved November 29, 2018. ^ "Italiancharts.com – Toploader – Dancing in the Moonlight". Top Digital Download. ^ "Dutchcharts.nl – Toploader – Dancing in the Moonlight" (in Dutch). Single Top 100. ^ "Norwegiancharts.com – Toploader – Dancing in the Moonlight". VG-lista. ^ "Swedishcharts.com – Toploader – Dancing in the Moonlight". Singles Top 100. ^ "Swisscharts.com – Toploader – Dancing in the Moonlight". Swiss Singles Chart. ^ "Australian-charts.com – Toploader – Dancing in the Moonlight". ARIA Top 50 Singles. ^ "The Irish Charts – Search Results – Dancing in the Moonlight". Irish Singles Chart. ^ "Charts.nz – Toploader – Dancing in the Moonlight". Top 40 Singles. 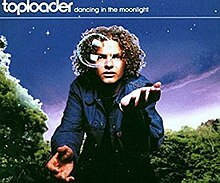 ^ "Spanishcharts.com – Toploader – Dancing in the Moonlight" Canciones Top 50. ^ "Top 100 Singles - Jahrescharts 2000" (in German). GfK Entertainment. Retrieved November 29, 2018. ^ "ARIA Charts - End Of Year Charts - Top 100 Singles 2001". ARIA. Retrieved November 29, 2018. ^ "Ireland - Top Singles For 2001". Allcharts.org. Archived from the original on May 5, 2012. Retrieved December 16, 2018. ^ "The Official UK Singles Chart 2001" (PDF). UKChartsPlus. Retrieved May 24, 2018. ^ "British single certifications – Toploader – Dancing in the Moonlight". British Phonographic Industry. Select singles in the Format field. Select Platinum in the Certification field. Type Dancing in the Moonlight in the "Search BPI Awards" field and then press Enter. "A Balance to All Things"